Ronny Five is taking heat for his failure to show at a scheduled appearance in the Bangkok Mall. The bioroid star of “Friendship, Upgraded” was supposed to meet and greet fans in front of the YucaBean for an hour. Instead, the crowd became rowdy and agitated when the star failed to appear. 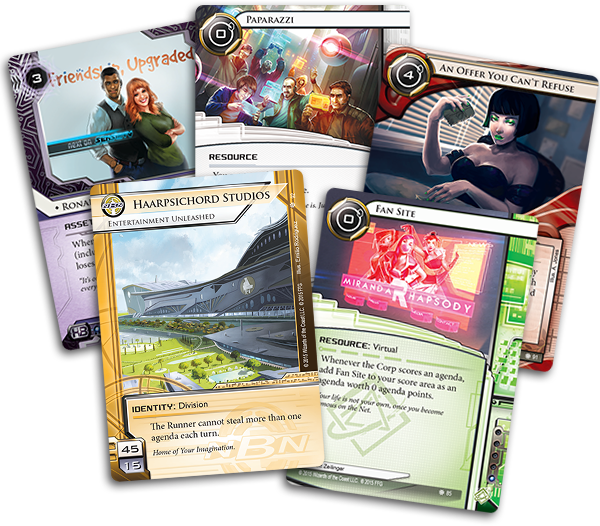 Fantasy Flight Games is proud to announce the upcoming release of Old Hollywood, the fifth Data Pack in the SanSan Cycle for Android: Netrunner! Wherever there’s a profit to be made, there’s someone looking to capitalize on the opportunity, and few are better at turning out the lucrative sensies than NBN’s Haarpsichord Studios (Old Hollywood, 92). Haarpsichord Studios is an ideal identity for those NBN players who want to make sure that they always have a new project in the works. 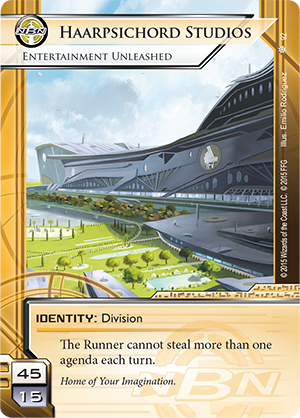 Its ability completely negates the risk that the Runner might steal multiple agendas in a single turn, meaning that you are free to play an entirely new style of fast-advance strategy, one that rewards you for installing multiple agendas at once. As an example, you might simultaneously green-light the latest Award Bait (Old Hollywood, 93) and hire some schlock director to recycle the plot of a fan-fave franchise in service of the next great Explode-a-Palooza (Old Hollywood, 94). You don’t even need to spend your valuable clicks and credits to install or rez ice. Why bother? If the Runner steals one, you still benefit, and he or she can’t steal the other. 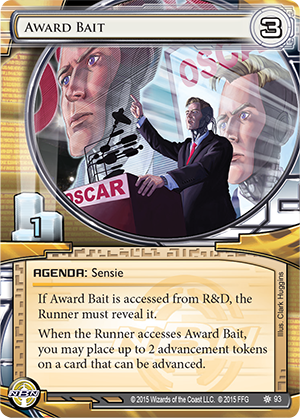 If the Runner steals your Award Bait, you can double-advance your Explode-a-Palooza to score it on your next turn for two clicks and two credits. 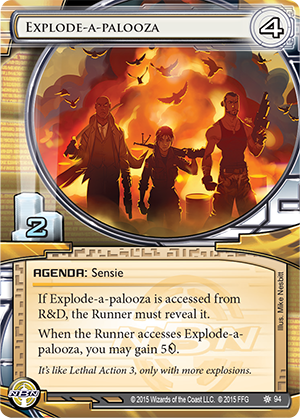 If the Runner steals your Explode-a-Palooza, you gain five credits, enough to triple-advance your Award Bait on the following turn and still have two credits remaining. Either way, it’s all part of the Haarpsichord design, carefully implemented after years of watching their rivals have projects ruined by untimely Spoilers (Old Hollywood, 82). They know you can’t place too many eggs in one basket. They know that, given time, someone always preempts the marketing machine with poorly timed leaks. Accordingly, they’ve focused on their processes, mastering the art of moving projects swiftly from the concept stages to post-production and mass release. In the end, Haarpsichord Studios always has another trick up its sleeve. It’s always working on the next big thing, and it doesn’t matter what the audience is talking about, so long as it’s talking. From the red carpet to the decrepit alleys where drug dealers hawk their wares, Old Hollywood offers a spectacular take on the hustle and bustle of one of SanSan’s most celebrated regions. NBN features prominently, with six different new cards, but they’re not the only ones interested in the entertainment industry’s comings and goings. 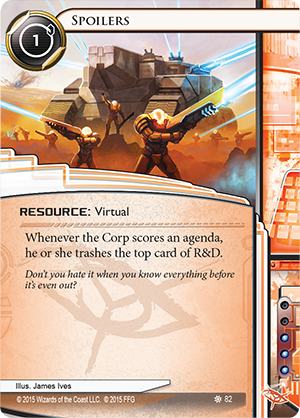 From the game’s jaded Anarchs to the black-suited operatives at the Weyland Consortium, everyone wants a piece of the action. There’s money to be made in Old Hollywood. Who’s going to make it? 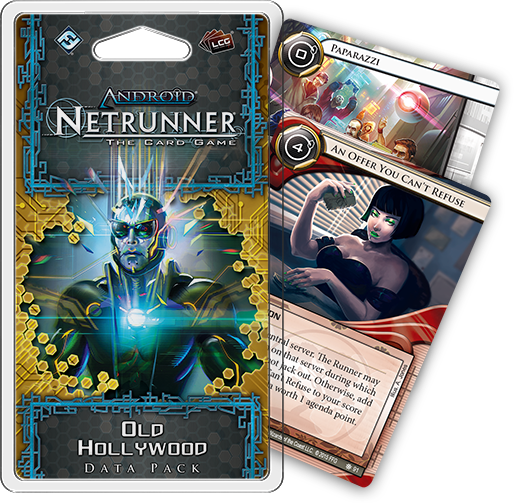 Look for Old Hollywood to add some glamor to your games of Android: Netrunner when it arrives at retailers late in the second quarter of 2015!